Puma Cages Fearsomely Trendy Fashion Beasts! If serendipity brought you to Croatia's Zagreb Zoo last week, you could've seen lions! and tigers! and bears! ... and hipsters! 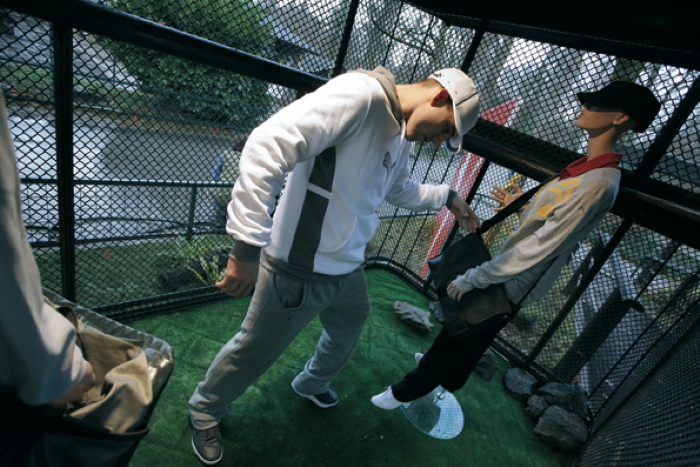 Agency Bruketa & Zinic parked "fashion beasts" in a cage to showcase Puma Sport's 2009 collection. And they didn't just stand around, either; sometimes they sang. These efforts, so different from the usual dolphins-catching-fish or monkeys-throwing-poo, were rewarded with heavy gawkage. We've seen people trapped in cages or store windows before, typically for more sobering reasons: to combat human trafficking, or fight for pigs' rights, or promote the objectively unloveable Dodge Magnum. In any case, we thought the fashion beast thing was a neat way to captivate both parents and kids -- which aren't typically receptive to noisy marketing messages during family time.